Congrats to my good friend Patty!! She's getting married!! 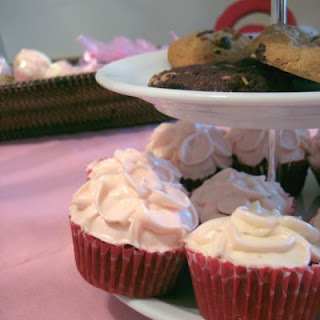 This past weekend, her sister's threw her the cutest bridal shower at one of their apartments. I wanted to make some sweets for the shower. Her sister was originally going to pick up some red velvet cupcakes from Billie's Bakery. I've been dying to make cupcakes so it was perfect. The theme colors were pink and red, so with the red velvet cupcakes I made a pink cream cheese frosting which I piped into flower petals. 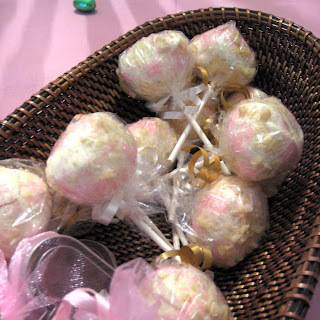 I decided to do more than cupcakes, so for favors, I made cheesecake lollipops with a white chocolate coating sprinkled with almonds and pink sugar crystals.